General Fixes Fixed an issue where for certain players hitting an armour plate with a bomb while the machine is frozen would cause more damage than intended. Fixed an issue where for some players the statistics of the Tearblaster were incorrectly displayed in the weapon wheel. Fixed an issue where for certain players heavy melee damage was the same on different difficulty levels. Fixed an issue in “The Looming Shadow” where for some players two guards would disappear after Blameless Marad speaks to them. Fixed an issue where for some players the auto save at the start of “Mother’s Heart” would not display the name of the quest and the player’s level indicator. New Game+ and Ultra Hard mode fixes Fixed an issue in New Game+ “The Point of the Spear” where for some players loading an auto save after speaking to Rost at his home would start from Karst’s location rather than near Rost. Fixed an issue in New Game+ “A Seeker at the Gates” where for certain players the objective ‘Override a Strider’ would remain on screen when using the Call Mount skill. Fixed an issue in New Game + where certain players were not able to enter or fast travel to Sunfall with the Adept Shadow Stalwart armour equipped. Fixed an issue in New Game+ where some players with the Adept Blast Sling were granted access to the Shock Trial in the Valleymeet Hunting Grounds, despite not having Shock ammo. Fixed an issue in New Game+ where some players with the Adept Blast Sling were granted access to the Freeze Trial in the Valleymeet Hunting Grounds, despite not having Freeze ammo. Fixed an issue in New Game+ where for some players kills with the Adept Tripcaster were not counted towards the Blast Wire Trial in the Nora Hunting Grounds. Fixed an issue in New Game+ where certain players were able to carry over heavy weapons from their normal game to their New Game+ loadout. Fixed an issue when playing on Ultra Hard mode where for some players shard values in player created errands are not updated when switching to a lower difficulty. Progression issue fixes Fixed an issue in “Deep Secrets of the Earth” where certain players would become trapped in a room if they solved the Power Puzzle while leaving the enemies guarding it alive. This fix requires a reload in order for it to work. Nachdem in den vergangenen Tagen bereits die US-Produktseite im Online-Shop der PS4 online ging, ist nun auch die deutsche an der Reihe: Horizon: Zero Dawn - The Frozen Wilds lässt sich für 19,99 Euro kaufen. Mitglieder von PlayStation Plus profitieren von einem zusätzlichen Rabatt. Sie laden den Zusatzinhalt für den Action-Rollenspiel-Hit zum Preis von 17,99 Euro herunter. Wer den Zusatzinhalt im PlayStation Store vorbestellt, erhält einen exklusiven Avatar für Horizon: Zero Dawn - The Frozen Wilds. Feature Improvements Improved photo mode with new features Added poses for Aloy Added facial expressions for Aloy Added 3 new filters Added a “look at the camera” mode for Aloy Added “greetings from” cards Improved the camera controls Added the option to hide Aloy inside settlements while in photo mode. Added a sell stack option at merchants when double tapping the square icon. Added filters and a legend to the in game map and the quest map. Added several new custom HUD options. Added an additional blue health bar on top of the player’s health bar whenever the Shield Weaver Armor is equipped to indicate the amount of extra health points the armor is providing. Added difficulty setting components to the Shield Weaver Armor’s damage protection. On hard mode the armor received a 40% armor reduction, on very hard the armor received a 66.6% reduction. Added the option to hide headgear for Aloy. Added the option to categorize and sort your inventory. Added categories in the crafting menu Green check mark for categories that are finished White icon for categories that have recipes that can be crafted Grey icon for categories that have no recipes that can be crafted Added the feature in the Sell menu at merchants, you can now press triangle to mark one or more items to sell items quicker. Added gameplay time to the statistics menu. Changed the timing of some tutorials that were repeatedly displayed, they are now less frequent. Added the option to control the x and y axis sensitivity of the camera. Added Spanish language support for North American copies of the game. Spanish subtitles can now be enabled, and Spanish audio is also now supported via a Spanish VO pack that can be downloaded from the North American PlayStation Store (in the week of 8th May). Progression Fixes Fixed an issue in “The Point of the Spear” where some players could safely drop into areas of the map during the Brave trials before speaking with Rost. Fixed an issue in “A Seeker at the Gates" where the certain users could trigger a save point in Mother’s Watch after becoming stuck behind the gate. Fixed an issue in “The Womb of the Mountain” where completing a weapon tutorial during the corruptor fight and reloading would block further progression for some users. Fixed an Issue in “The Field of the Fallen” where some players found Erend to get stuck in the floor after killing two ravagers at the ambush site. Fixed an issue in “The Sun Shall Fall” where some players could avoid the trigger before entering the Throne Room. Resulting in the ear bleeder not spawning until the player reloads to an earlier save. Fixed an issue in “The Sun Shall Fall” where certain players got stuck on the objective ‘Investigate the Area’ or ‘Go to the Solarium’ if the player avoids certain triggers. Fixed an issue in “Deep Secrets of the Earth” where some players were unable to progress the quest after the former patch. Fixed an issue in “A Daughter’s Vengeance” where a large plant filled area lacked collision resulting in some playersgetting stuck in the environment. Fixed an issue in “Collateral” where some players had machines intrude the conversation with Fixed an issue in Cauldron Xi, where some players were not able to progress due to missing a progression marker. General Fixes Fixed an issue where certain players would not be able to perform a Strike from Above while jumping. Fixed an issue with Aloy’s body momentarily disappearing for some players when performing a Strike from Below on cultists. Fixed an issue where Aloy appeared to be out of focus for some players when the camera is brought close to her. Fixed an issue in “The Point of the Spear” where for some players Aloy still has two spears in her inventory after the recent patch. Fixed an issue in “Mother's Heart” where some players meant to confront Olin about his Focus during the speech, but were able to escape from the area resulting in the inability to return. Fixed an issue in “The City of the Sun” where for certain players the tutorial message would still appear after completing the quest. Fixed an issue in “The Grave Hoard” where some players were able to leave the map and get stuck outside of the playable area. Fixed an issue in “Deep Secrets of the Earth” where if some players surpass the trigger for the movie sequence, the main story quest will not progress upon entering the bunker. Fixed an Issue in “Deep Secrets of the Earth” where enemies would not respawn for some players after Aloy dies during the “Kill the Eclipse” objective. Fixed an issue in “To Old Acquaintance” where for some players Aloy would become stuck in a pose after interacting with the basket. Fixed an issue where for some players an NPC would sit on a chair or bench while in combat resulting in their bow floating in midair next to them. Fixed an issue where certain players would get stuck underground while fast travelling away from a Tallneck. Fixed an issue where weapons would be disabled when some players fast-traveled whilst throwing a rock. Fixed various animation errors that occurred when some players mounted damaged machines. Fixed an issue where some player would not get the appropriate health notifications after playing for 3 hours and 30 minutes. Fixed an issue in “Cauldron Sigma” where for some players items dropped on the platform would not elevate up during the animation. Fixed an issue where certain players who ride a mount from the Spire would be able to bypass the “mount can’t enter this location” message in Meridian Village. Fixed an issue where for some players the Stormbird would become dysfunctional after its state was repeatedly changed between burning and stunned. Fixed an issue where certain players who tried to enter Sunfall with a mount without the appropriate disguise would get kicked from the mount while the camera kept its focus on the mount. Fixed several issues where for some players in certain occasions dropping a Treasure Box would leave the Treasure Boxes floating the air. Fixed an issue where certain players were told to quit the main menu incorrectly when attempting to change text or speech language on first boot. Fixed an Issue were for some players several blue lines would be visible in the lower part of the screen during a Conversation. Fixed an issue where certain players’ corruption hit responses will continuously repeat if the player sprints while getting into an injured state. Fixed an issue where some players could be suddenly thrown off a Tallneck and instantly killed if it makes a sharp turn. Fixed an issue for certain players where any second or third rare/very rare handling mods attached to a weapon did not apply the expected stat increases. Fixed an issue for some players where two or more similar uncommon or rare mods applied to both weapons and outfits consistently don’t apply their indicated improvements. Fixed an issue where some players are still able to enter the World Map and Fast Travel right after an interaction has been triggered with triangle and when specific HUD messages are active. Fixed an issue where certain players selects graphics mode “4k resolution” while on a 1080p TV, it would give a flicker in the shadows of the distance indicators. Fixed an issue for some players where the interior map text overlapping the menu categories on the local map screen. Fixed an issue for some players where the fan would speed up when opening the map on a PS4 Pro. Fixed an issue for some players where the language would reset in the language selection menu. Fixed an issue for certain players with the subtitle select in the launch menu Fixed an issue where for certain players if they would reload their save for a second time after agreeing to bring Olin to the Farmstead they will spawn at the last saved campfire. Fixed several collision issues for some players. Fixed several sound issues for certain players. Minor text fixes. Crash Fixes Fixed various miscellaneous crashes. Please download Horizon Zero Dawn patch 1.20 and let us know what you think. We’ll continue to work on further fixes for and enhancements to the game based on your comments. In the meantime, keep an eye on this space for the latest Horizon Zero Dawn news and updates! NEW FEATURES Added support for background music playback. Added the ability to drop treasure chests. FIXES Progression Fixes Fixed an issue in “The Point of the Spear” where some players could escape the quest area and get stuck here, blocking progression of this quest. Fixed an issue in “A Seeker at the Gates” where some players could get stuck behind the gates to All-Mother Mountain. Fixed an issue in “The City of the Sun” where some players were able to exit Olin’s basement during the ‘Investigate Olin’s Secret Workshop’ objective. Fixed an issue in “The Grave-Hoard” where the objective would not update when some players fast traveled away after activating the Holo Projector. Fixed an issue in “Deep Secrets of the Earth” where some players could avoid triggering a cutscene, resulting in the quest not progressing. Fixed an issue in “Fatal Inheritance” where talking to Ranaman after freeing Daradi would cause Daradi to disappear for some players. Fixed an issue in “Hammer and Steel” where for some players the quest objective would not update after gathering all nine Behemoth Cables. Fixed an issue in Cauldron Xi where some players could avoid triggering a cutscene, resulting in the quest not progressing. General Fixes Fixed an issue in “The Point of the Spear” where the objective ‘Meet Rost at the North Gate’ would always be marked as failed for some players in the objective log. Fixed an issue in “The Point of the Spear” where the fix for duplicate spears introduced in Patch 1.12 would not solve the issue for some player if they already finished “In her Mother’s Footsteps”. Fixed an issue after “The Proving” for certain players where Aloy would not retrieve her Focus after visiting Rost. Fixed an issue where some players could permanently lose the Tearblaster in their playthrough after selling it at a merchant. The Tearblaster will now be available to purchase from certain merchants after completing ‘Hunter’s Blind’. Fixed an issue where a pile of Ancient Debris appeared to be located underground for certain players. Fixed an issue where some players were not able to pick up their loot when it was dropped in water. Fixed an issue in the “Gatelands” Bandit Camp where some players could get stuck in a rock after performing a ‘Strike from below’. Fixed an issue when certain players would try to mount during Aloy’s falling animation, causing Aloy to float in midair. Fixed the issue where some players were able to gain +10,000 XP every time they cleared hunting trials with all Blazing Suns. Crash Fixes Fixed various miscellaneous crashes. Wer in Horizon: Zero Dawn die Platin-Trophäe einsackt, darf sich auf ein Geschenk von Sony freuen: Als Gratulation für die erspielte Leistung erhalten alle Platin-Jäger ein kostenloses Theme, mit dem sich der Dashboard-Hintergrund der PlayStation 4 verzieren lässt. Auf Reddit.com veröffentlichte Screenshots zeigen das Motiv. Um ein dynamisches Theme mit Spielmusik handelt es sich übrigens nicht. 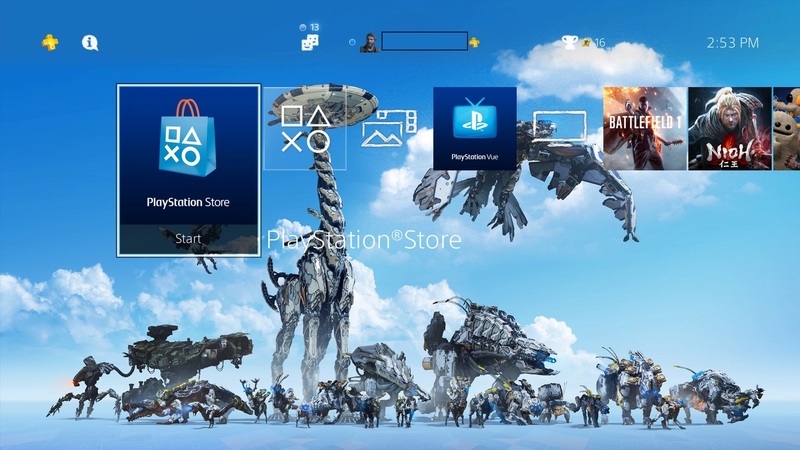 "Aber das Motiv ändert sich, wenn man zwischen den oberen und unteren Menüs der PS4 wechselt", schreibt ein Spieler, der das Theme für Horizon: Zero Dawn bereits erhalten hat. Horizon ist für Sony die erfolgreichste Einführung einer neuen Marke auf der Playstation 4 und überdies die erfolgreichste Spieleveröffentlichung von Guerrilla Games seit Bestehen des Studios. "Wir wussten, dass Horizon Zero Dawn etwas Besonderes werden würde. So nun zu sehen, dass sich die tolle Resonanz von Kritikern und Konsumenten auf ein brandneues Spiel in derartigen Verkaufszahlen wiederspiegelt, ist äußerst erfreulich", so Shawn Layden, Chairman der SIE Worldwide Studios. "Guerrilla hat ein schlichtweg herausragendes Spiel geschaffen und die Reaktionen, die wir von Seiten der Fans erleben -von Stunden um Stunden gestreamten Gameplays bis hin zu endlosem Foto-Sharing - unterstreichen, welche Wirkung es erzielt hat." "Wir sind hoch erfreut, dass Horizon Zero Dawn von Kritikern und Spielern gleichermaßen positiv angenommen wurde. Die Entwicklung des Spiels war eine Herzensangelegenheit, und insofern ist es äußerst befriedigend zu sehen, dass es bei Spielern die gleiche Leidenschaft und Begeisterung hervorruft, die wir selbst während der Spielentwicklung fühlten", sagte Guerilla-Geschäftsführer Hermen Hulst. "Dies ist erst der Anfang von Aloys Geschichte und unserer Erkundung der Welt von Horizon Zero Dawn. Das Team arbeitet bereits an einer Weiterführung der Geschichte." Main Quests Fixed an issue in “The Proving” where one of the attackers would fall down the slope. Fixed an issue in “The Womb of the Mountain” where the spear would not be in Aloy’s inventory if players opened a treasure box with a DLC item before retrieving Aloy’s weapons. Note: Players who have already encountered the issue will need to reload from a game saved prior to this quest. Fixed an issue in “A Seeker at the Gates” where players would be able to enter the gates of Mother’s Watch when fast-traveling to this location. Fixed an issue in “A Seeker at the Gates” where the quest objective would not update from “Go to the Carja Border Fort” to “Kill the corrupted machines”. Fixed an issue in “A Seeker at the Gates” where players could not progress through the Carja Fort. Fixed an issue in “The City of the Sun” where Erend wouldn’t spawn after the dialogue with him ended if players rushed past the civilians on the bridge. Fixed an issue in “The Sun Shall Fall” where players couldn’t return to Dervahl if they fast-traveled during the objective “Talk to Dervahl”. Fixed an issue in “The Grave Hoard” where skipping the conversation with Sylens at the end of the quest and immediately restarting would prevent “To Curse the Darkness” from starting. Fixed an issue in “Deep Secrets of the Earth” where players couldn’t enter the bunker if they fast-traveled away from the objective after they had interacted with the bunker. Fixed an issue in “The Terror of the Sun” where Aloy would respawn in an empty arena after being killed by the Behemoth. Note: Players who have already encountered the issue will need to go to Sunfall, at which point they will be teleported back into the arena to continue the quest. Side Quests and Activities Fixed an issue in “Hunter’s Blind” where the objective would not update after talking to Talanah. Fixed an issue in “Hunter’s Blind” where players could kills the Glinthawks before the actual objective was triggered. Fixed an issue in “The Foreign Lands” where players could already deliver the bow to Lakhir before being instructed to do so. Fixed an issue in “Fatal Inheritance” where the objective would fail to update after disabling the lure device and speaking with Ranaman during the quest. Fixed an issue in “Blood on Stone” where the Rockbreaker would not surface correctly if players fast-traveled from and to the quest area just before the start of the sequence. Fixed an issue in “Death from the Skies” where the Stormbird objective would remain active after deactivating the lures and fast-traveling from and to the quest area. Fixed an issue in “Redmaw” where Redmaw would be alive again if players left the quest area during the objective “Talk to Ahsis”. Fixed an issue in “Redmaw” where the marker for the objective “Talk to Ahsis” would be invisible outside of the quest area. Game Systems Fixed an issue where exploration music would drop out after a long period of play. Fixed an issue where Aloy could become ‘stuck’ in her sliding animation. Fixed miscellaneous issues to improve the overall play experience. Dieses Quest kann man wiederhollen und die Trophähe auch später nachhollen, die Finalle Quest ist so zusagen beliebig oft wiederhollbar, das ist im Spiel extra so gemacht. Die britischen Verkaufscharts wurden nun offiziell enthüllt. In der vergangenen Woche konnte sich Sonys “Horizon: Zero Dawn” demnach gegen Nintendos “The Legend of Zelda: Breath of the Wild” durchsetzen. Zudem haben Joe Henson und Alexis Smith („LittleBigPlanet“, „Assassin’s Creed IV: Black Flag“) sowie Niels van der Leest („Pac Man“) Kompositionen beigesteuert. Wie heute bekannt gegeben wurde, besteht auf Spotify ab sofort die Möglichkeit, sich den offiziellen Soundtrack zu “Horizon: Zero Dawn” zu Gemüte zu führen und musikalisch in das Abenteuer abzutauchen. Unter dem Strich umfasst der Soundtrack zu “Horizon: Zero Dawn” vier CDs mit über 80 verschiedenen Stücken und einer Laufzeit von mehr als vier Stunden. Neugierig geworden? Dann findet ihr den besagten Soundtrack unter dem folgenden Direkt-Link. Das stimmt, aber z.B. Polygon und viele andere habben die Spiel-Story komplett durchgespielt und ich denke das werden schon so 30h etwa sein.